Riding on a rented red London Double Decker bus, drinking champagne was how I found out, as you do. "Sure thing, thanks Jim, I will get in touch with Juliette..."
"Very good." He smiled, turned back to Geoff Kempin of Eagle Rock, and continued to discuss the next couple of Queen DVD/Blu-ray releases. I was already in a really good mood, but this news just heighten my glee - you know that little nervous / excited skip you get in your tummy? 'Pop', there it was. "You're coming? That's great...you better crack that open then!" So here I am a few days before I leave, half packed and about to pop into town to grab a few last bits for my travels, reflecting on my last tour with the band and looking forward to this one. Once again, I had to put in a pitch for a place on the plane and again it was pretty simple - "South America - This is Queen Country". There was a bit more to it, but not much, however what I did have in my favour was that the feedback I had got from the North American Tour was that I had actually turned out to be pretty useful about the place, which was nice. I was also asked to do the European Tour earlier in 2015, but 6 weeks away from my girls was just too much for me...plus the wife said "No." b) missing my other half's 40th birthday. I'm a selfish prick, I know. 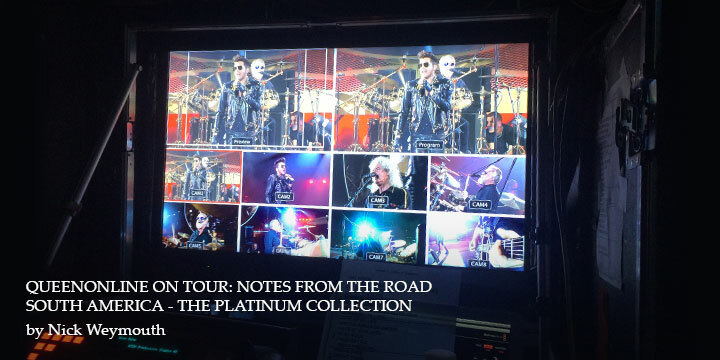 Going back to the NA Tour once more; I have to say it was one of the best things I have ever be part of, I have worked on several one-off live events (The BRITs, 46664 shows), but never a tour and I am glad many of you enjoyed my 'Notes From The Road' - it kind of helped me enjoy it more, relaying what was unfolding in front of me each day. The plan is to do the exact same thing, tell you how I see it. However, if you have any ideas on what you might like me to cover please e-mail me at [email protected] - of course, be sensible, I do not have unprecedented access to Brian, Roger or Adam and I am not going to sneak around exposing intimate details or compromise security! OK, so here we go, let's see what South America has install for us. I am particularly looking forward to Queen's return to Rock In Rio - I can recall the first time I heard of it, Guns N' Roses were finally returning to action with their Use Your Illusion albums in 1991 and with typical audacity picked RIR to take their bow – it has held quite the mystic with me since then. I have also heard how utterly frenzied (in a good way) and keen the Argentineans are, and Chile, well I look forward to meeting you, but thanks for Alexis Sanchez, he has lit up the Premiere League! Just so you know, I have struck a deal with a Brazilian friend of mine who is going to translate these entries into Portuguese, plus QOL's Wilki in Argentina will deal with the Spanish...although he doesn't know that yet. My attempts would be futile, although a quick Google translate might make these updates more entertaining/even more confusing for you! Right, back to the packing, the taxi picks me up at 3.30am on Friday (uh)...I'm not complaining really. I can't imagine I will have much more to say until I actually get to Sao Paulo on Saturday to be honest, although last time I did manage to blog on my in-flight movies…belated apologies on that one! So you can consider yourselves dismissed until then and let me know of any thing you might want me to report on. I'm back in the 'The Game' - Queen pun intended. The prep for the 'Don’t Stop Me Now' Tour is fully underway. As I type this in a rather chilly Production office backstage, the crew are out front assembling the 'Q' and the final LED screens and lighting rigs are being tinkered with; more of all that a little later. I don't know what it is like for any of the crew, but seeing as I don't 'tour' as part of my regular job, the wrench in leaving my wife and two little monkeys was really quite hard this second time round. Sure, it was my choice, I'm being paid and what an opportunity to have to see the world as part of this 'rock n' roll thing' that rules my life. I would never speak for others on this crew, but seeing as touring is part of their career choice, I am sure they have their own ways of coping with leaving domestic life and they themselves and their friends and family would be used to it or at least prepared for the time apart, but for me it did sting. That said, what is warming about this motley crew is their clear affection for one another and as mentioned in my last update, there is a very large number of the same team here which creates for such a great vibe. I wont bore you with my flight too much, but the fun did start early at the airport as four of us, including Steve Price (Video director funny man), Ned Bull (Catalyst Programmer - awesome job title right?) and Ross Deeker (Pyro - yeah!) all had to sprint between gates from our connecting flights in Paris to Sao Paulo, only to endure a 13 hour haul to be told our bags were still in the French capital. An outstanding start to the trek...and yes, therefore I am sitting here wearing the same two-day-old clothes and smelling of ‘Security’ Dave’s deodorant. This unfortunate wardrobe malfunction did not deter me too much and a delightful local production assistant called Carol, who had arranged our ground transport to the hotel, greeted us outside the airport. I wish I could say I was greeted by the sites and sounds of Brazil, in some wonderfully poetic and romantic outpouring, but I was stuck in rush hour traffic, in the dark with the rain battering away on the roof of the van. In my head I thought I was going to be exposed to some sort of explosive street carnival and dancing festival crowds bursting with colour grooving to a Latino beat. I really can get a little carried away in my head sometimes. It was teaming bonding 'a go-go' once we hit the hotel. Lots of kisses from the ladies and manly hugs from the gents and a whole lot of "how are you doing?” in the main bar, even for me, who had only been part of half of the US Tour over a year ago, I was welcomed back into the fold like some sort of tour mascot. I told you they were a nice bunch. I retired after two beers and a quite fantastic cheeseburger, only to check my e-mails and see all the Rock In Rio Press Conference coverage I had to highlight that had been generated during my time up in the clouds. I can reveal it now of course, but the band had been in Rio, not only for promotion, they had been holed up in a small rehearsal space in the city honing the set list. At this point I honestly don't know what is lined up set list wise; I have even badgered Spike about it. So back to today, here we are in the Ibirapuera Arena for three days of Production Rehearsals before the eventual show in the same venue on the 16th. The atmosphere is quite relaxed, as we have time in the venue to sharpen the operation before we have to turn around shows in a day further along the road. For me it was fun getting back into the swing of life in the production office; walking the venue and deciding on what rooms would house which band members, wardrobe, the promoter and tour management, arranging tables and cables, setting up the wi-fi, sorting and hanging the signage so people know where to go, distribution of tour itinerary handbooks and luggage labels, pushing the odd flight case about, experiencing the Brazilian catering (a sausage and potato combination, with brown rice and salad, if you really want to know, washed down with a nice Pineapple and Lemongrass juice), meeting the local runners and assistants and generally, just getting set and remembering to write this! The venue itself is quite interesting in that it is a tight, circular auditorium with an incredibly high ceiling. Taking into account the large stage, which has been modified slightly for this show, the layout of the venue and the legendary Brazil passion and history with the band, I have a hunch that the show has the making of something quite wonderfully intense. The band and backline crew (instrument techs) are on their way from Rio as I type, this means two things 1) the real musical aspect of this production now kicks in and 2) the whole touring party will now be one = party time / things now get real. Jet lag does not seem to have kicked in just yet, as I stayed up last night and tried to adjust to local time, but tiredness is still scratching away at a little, but the excitement and anticipation of the fun ahead is a fine numbing ingredient. NEWS JUST IN - my bag has arrived at the hotel! Celebratory clean underwear all round! Surely that is an excuse to re-sample the local brew tonight? South America. Let's do this. Sunday: a day of relaxation for many, a holy day for others. For us here at the Ibirapuera Arena it brought our very own Robert Plant* look-alike, the Guitar man's Man - Pete Malandrone. Fresh off the plane from Rio, he led in the back line team and before I knew it, drums were appearing on both the main raiser and our (new!) B-stage, Neil's stand up basses were in position, Ru's kit sprang up, a bank of Vox amps stood proud on stage left and keyboard tech Ben was flicking me obscene, but funny gestures from beneath Spike's set up. They might be the jokers in our pack and the more rock n' roll of the team, but they don't muck around this lot, they are good, really good. "You'll like this, check this out...say hello to the 'Buzz-O-Meter, you can stick this in your blog." I was hanging out with the Iain, our country bumpkin of an electrician, when he produced this strange little gadget. It is a handheld piece of equipment that is completely unique to his kit and Queen in general. It consists of a single Brian May pick up (like he has on his guitar) fused to a small amp with some settings with some headphones attached. The idea is that Ian walks around the stage with the headphones in place listening to see if the hiss turns into a buzz and to locate where it is coming e.g. a power generator under the stage, a light that might be overhead. If this is the case, it could mean that BM's guitar could pick up a similar buzz whilst rocking out and playing live onstage. Ian will then report this in to Pete and attempt to re-route any power or cables away from the area. He said there is no exact science to it really as each venue can be different. The things you learn eh? The later part of the day saw a general sweep of the backstage area to prepare for the band and their immediate teams arrival. For example making sure the dressing rooms are tidied, simple things like checking lamps work, that they have clear sight of the signage when they leave their rooms, that the wi-fi has a clear signal in each room and the passwords were stuck on walls, fridges are working and ready to be stocked, set lists from rehearsals are distributed to each department. Outside in the arena, smoke machines are being tested giving an eerie look to the room, gold spray paint is touching up parts of the stage, Rob Sinclair is buzzing people's heads with his toy drone, video screens are flickering and radio mics continue to crackle in both English and Portuguese... and I fail understand either, its often just a squall with the occasional name of someone I know. I literally have to tune and train my hearing to get used to it. The Red Special was taken for a little walk at around 8:30pm; Pete teased out that swampy blues version of 'Tie Your Mother Down' he often tests with. A few thwacks of RT's drums were also heard, but he real soundcheck and testing gets going tomorrow morning, followed by a full run through of the entire show - lights, cameras, action...and several rather well know popular rock anthems. The Morning after the night before - I am signing off this installment at 11.53am (Monday morning) as the PA is buzzing followed by occasional blasts of Sting's 'Fields Of Gold' and some pretty harsh dance beats. There are more people around now, extra security now lines the corridors and gates outside and the Tour Management team have taken up their places here backstage. Here in the Production Office, the hub of the backstage operation, local runners are flying in and out dropping items that have been requested; the last delivery included, black paint, some plywood and an aluminum plate, plus a Starbucks order. The relaxed vibe still exists, but is slowly being fused with a more business like behavior and urgency - people are basically walking around quicker. This is Neil within 34 seconds of arriving; "What is the difference between a Hippo and Zippo? One is heavy the other is a little lighter." But before all that, taking up from yesterday's blog and the arrival of the band and few more "Hellos". With the Production office situated at the top of the corridor (in this venue anyway), it is the first stop for anyone making their way backstage to offices and dressing rooms, it's almost like going through passport control before you can proceed and then often turns into the 'kitchen' at parties where everyone ends up hanging out. I chatted briefly with Rufus about his 'other job' in The Darkness and the fun his having, discussed the Queen Extravaganza's UK Tour of 'A Night At The Opera' with Tour Director Juliette and managed 5 minutes with Queen manager Jim Beach, discussing the success of our Freddie Mercury Birthday Party in Montreux 10 days ago and our plans for next year. I have only seen RT and BM from the stage at this point, I gave them both an acknowledged salute and nod respectfully from side of the stage yesterday - plenty of time for all that of course, we are getting towards the business end and the opening show. I saw Adam arrive in his vehicle from afar and then prowling the stage later on that evening. So with all that pre-amble above out the way, here is what you might want to hear...my "deliberately, non committal, generic, keep me out of trouble, non spoiler notes of Production Rehearsals - Day 1"
- The dry ice machine works...as in, really works. We nearly needed fog lamps at one point. - Brian stayed back on his own and continued to play on the main stage. It wasn’t his solo I don’t think. Maybe he was just having some fun to be honest, that's what its all about in the end right? Neil bounced around the backstage afterwards and proceeded to tell me a very long-winded drummer / bass player joke - I won't repeat it - it wasn't his finest and I told him so. I did chuckle a bit when he was out of sight though. Don't tell him. I told you the Production Office was a social hub; I just bumped into the guitarist from Queen and had a lovely little chat. What a nice man. Right I'm off for a late lunch. Drums are being thumped, sounds like we are getting going. The next time you hear from me may well be after the opening show, but fear not I will be adding more pictures via instagram and across twitter and facebook, plus of course, blasting up the set list post-show. Sao Paulo, Show Day. The first show of the tour then and having been semi -permanent residents at the Ibirapuera Arena for the past several days, it was nice to actually get going and use this space for what it was intended. On arrival at the arena, despite our early start, we had clearly be beaten to it by at least 20 fans already sitting down and queuing outside the general admission gate, some 12 hours BEFORE show time. During the afternoon I temporarily became the most popular man in the building, when I was tasked with handing out the 'per diems' to crew members. Anyone who is essentially giving out pocket money to a 30 man strong beer-drinking machine is always going to be greeted with the utmost respect and affection. My day also included sorting out the evening's guest list. It turned out to be the most complicated ticket and seat distribution equation ever; it even had the venue promoter stumped. The 'fun' of this frustrating chore indirectly led another little job; remembering to keep back an unused ticket from each show for the Queen archive and its guardian Greg Brooks. At dinner, I had the pleasure of catching up with Queen's long standing PR man Phil Symes, he is now based out of Brazil and is along for part of the tour. I had not seen in him person since the Stormtroopers In Stilettos exhibition in 2011. Phil has a wonderful calming influence and always sees things from a very different angle; I guess this comes from dealing with the press all this years. Following the soundcheck, a set list change was mooted, and it was duly confirmed at around 8pm when Spike came by told me that Roger was singing ‘These Are The Days Of Our Lives’ and ‘Save Me’ had moved up a spot in the running order- reprinting and redistribution of the set list was therefore required. The next job was to top up the water and towel supplies for the backline guys and checking that they had all they need for looking after the band from the side of the stage during the show. At 9.43pm I was suddenly thrust into the world of Wardrobe when Neil asked if he should go with a black cap or a grey one - I told him to stick with the black. I saw Rufus in the corridor and wished him the best for the show and then took a quick walk around the top flight of the arena to take in the atmosphere. With the Made In Heaven 'Track 13' drone intro tape well underway, I perched myself for the start of the show on stage left, just behind Spike, and started to look around cheerfully at the expectant faces in the crowd. At the moment, I was called over the radio to urgently acquire some honey for Neil from catering - this was, I kid you not, just 4 minutes before show time. How rude, I was just getting settled for the gig! I made it back to my position just in time to see the hugs and high fives amongst the back line guys, Pete and I exchanged the devil horns and a childishly flick of the tongue for good luck. The lights went down and sheer thunder descended on top of me, it was hair raising. If noise carried weight, I was feeling it all over. Brazil you are LOUD. The band cracked into a revved up version of ‘One Vision’ and in a blur it was gone - the whole song was an assault on the senses. Then came ‘Stone Cold Crazy’; the place was literally shaking with the power of the crowd and band united as one, and the smiles, yes, the smiles on the these Brazilian faces was so heartwarming, THIS was Rock n' Soul. And so it went on; Adam working the crowd like the accomplished front man he has now become, the chant of "Brian May! Brian May!" and the B-stage introduction of Roger that nearly took the roof off. I am not going to apologise for getting carried away, I have not experienced such a gig of this intensity. As the show went on I continued to post a picture for each song in the set list. I know some of the images that go up on Facebook, twitter and instagram are not award winning, but what I try to do it take pictures from my view, and open it up to you guys. One of my favourite places to grab photos is in the truck where our video director Steve Price is calling shots to his cameramen; it is his choices that you see out front on the screen. It's great to watch and hear some of the funny things he comes out with to get the angles he wants. Highlights for me included the debut of Adam's ‘Ghost Town' with it's new Queen makeover, it makes for a decidedly wicked 'Disco Metal' anthem and the online buzz surrounding this surprise inclusion has been immense. 'Fat Bottomed Girls' is always a great groover for me, and the way Brian now directs his on-guitar camera around the band just adds to the fun. 'Under Pressure' NEVER fails. Of course, it will come as no surprise to report that 'Love Of My Life' was the standout moment of the show, if not as a song, but as an emotional marker for Queen and Brazil's eternal love affair. "You made this song what it is...this is your song Brazil." The next four minutes or so was pure romance, and when Freddie appeared on the big screen you can imagine the reaction. I saw at least 3 teary eyed fans from where I was watching near the barrier. Before long, Neil was saluting me from the stage during 'We Are The Champions' and it was done. It really is quite amazing how fast the show can fly by. It was all rather draining, but is a great way. Load Out: It was 12:30am and the first breakdown of the tour in a very tight venue resulted in was a late or early finish for many. The last return to our hotel I heard was 5.40am, I was one of the lucky ones, and I got to bed just after 4.00am. My part of the load out is easy compared to the 'proper crew'; grab the signage, break down the wi-fi, tidy the office, pack and load the Production Office flight cases, ordering beer and food for those staying later and ripping down any sign of our existence in the venue i.e. set lists, stage times, wi-fi passwords etc. This can take a little time depending on the size of the venue, but is nothing compared the guys out front, who were literally dripping with sweat as they passed our door. Directly after the show the band stayed back for a change of clothes, chatted over a late dinner and discussed how the show went. Brian was the last to leave as he was overseeing his selfie stick video upload. On his exit he made a point of shaking hands with all those he came across as he headed to his car, I got a nice little smile as he went on his way. As mentioned above, it was a long night for most, but we still had a plane to catch at 10am that morning, which meant a 7am lobby call and convoy of crew buses to the airport. We all sat together on the plane, but it was the quietist I have ever heard this lot! It was a short flight, but we all took maximum advantage and grabbed a bit of shuteye. I was pretty excited about coming to Rio; I've seen the Duran Duran video. I was not disappointed either; the view coming in on the plane was spectacular. I was soon in a bus taking the luggage to the hotel, as some of there crew headed straight to the festival site to get a head start. The 'Rio vibe' really does exist - slightly chaotic, busy, colourful, dramatic, shouty, built up, yet organic. Helicopters buzz overhead and huge birds swooping around the big blue skies. It all then clicked perfectly; a great view of Sugar Loaf mountain, there was Christ The Redeemer looking over us, signs to Ipenema and the mecca of Brazilian football the Maracana Stadium and last but not least, suddenly there it was...Copacabana Beach complete with spectacularly worn swimwear of all shapes, sizes and tightness included, all very proudly displayed too. Several of the crew have worked at Rock In Rio, most recently with Rhianna in 2013, so I pestered them a bit on what it was like, but not too much, as I wanted to soak it in myself on gig day. We set up in the portacabins that afternoon as the crew grabbled with the challenge of working our rig into the main stage. The band arrived at about 8pm and Roger led them through soundcheck up for an hour up until the noise curfew at 10pm. Today then, ‘Rock In Rio Day’. I woke up at 10am and covered off some outstanding work, including posting news on the reaction to 'Ghost Town', I spoke to the wife, ordered room service and then made my way down to the pool and beach area. I popped down to the sandy shores of Leblon beach, which was just below our hotel, and succeed it being battered senseless by the waves and exfoliated by the sand. It was one way to warm up for a gig, I guess. It is now 11.08 pm and here I am backstage finishing off these notes, 30 years on since Freddie, John, Brian and Roger were here. The portacabin office is shaking to the bass throb of One Republic and the air conditioning is chilling us all to the bone. I have passed out all the set lists - and yes, it is different to Sao Paulo - and I now have to secure some towels and water for Peter and the gang for show time. We are nearly ready for you Rio, you guys sound ready for us - the huge, thick wall of sound you are creating out there is quite astonishing, heavens knows what is going to go off when we hit the stage. I think this might be quite a night. I am back off to the side of stage…see ya! I am not going to review the gig for you, there are plenty of clips, images and reviews out there for you to check out, but what I will say is this; the bond between Queen and Brazil is an eternal one, and it has come full circle for Brian and Roger, I know for a fact this show meant a great deal for them. It was a privilege to be standing at the side of the stage for this show; the experience was utterly unique for me. I normally look up at the band on our own stage, but here on the Rock In Rio set up I was standing on level with them and could as near possible see what they were seeing, and what beautiful sight you were Rio - a sea of pure joy and happiness. One other observation from having access to that view is you can see all the on stage banter between the band; the winks, the calls to wrap up songs, the intros, the nods and the laughing. I never take my job for granted. As clearly recognised from show in Sao Paulo, 'Love Of My Life' is to be the soundtrack for this trip, but Rio highlights for me came is the form of possibly two of Queen's poppier moments; Deaky’s 'I Want To Break Free' was a gigantic sing along with the crowd playing their part as an unpaid choir, and when Roger took up lead vocals on 'A Kind Of Magic' the view of the crowd clapping along brought huge grins from those of us taking it all in from the wings. With the show ending at just after 2.30am in the morning and our load out taking three hours as we crossed over with Metallica's crew who were loading in, it meant I got to see the sun rise over the festival site and it was actually quite lovely. I made a point of walking through the main crowd area, which was now only filled with thousands of beer cups, our own golden glitter from 'We Are The Champions' and site staff surveying the tidy up in front of them. Other than the occasional shouts and crashes from the stage it was all very eerie, yet peaceful at the same time, the calm after the storm if you like. We have 3 crew buses on standby to shuttle us back and forth to the hotel and once each department is packed up, we ship them out. The guys who are normally on their way first are those working the sound, video and monitors, however a spontaneous drinks party broke out just outside our Production office and everyone was happy to stay back and hang out in the wake of the show - friends will be friends. If you think this is glamour and fun, think again. I had just 1 hour and 34mins sleep on returning to our hotel, we had our lobby call for 7.30am to catch our plane to Porto Alegre. The welcome to our latest destination was a bumpy one, the last 20 minutes of the flight was a rather unpleasant, turbulence filled joyride that saw several of us nervously laughing at each other. Clearly a very different weather system was at play and the warm climate we had enjoyed in Rio had now been replaced rain and grey skies, not cold, but our shorts and shades have been packed up for now. Later than evening, thanks to the self-appointed Social Secretary, Tom New (Front Of House Engineer), many of us went out to dinner at a Brazilian/German BBQ restaurant. It's always going to be a good night when the restaurant actually picks you up in its own branded van to take you there! It was quickly christened 'The Meat Wagon'. Crew bonding complete over wine and carvery, we all pilled back to the hotel for caipirinhas, random sloppy games at the billiards table and for some of us, me and a certain guitar tech included, use of the hotel pool at 2am during a quite spectacular electric storm. "Thunderbolts and lightening, very, very frightening..."
Sorry about the above, too obvious I know. We had overnight load in yesterday for today's show, nothing too spectacular to report on that to be honest, another thunderstorm joined us right over the venue and briefly held up proceedings, but that was it. The weather has been relentless; I think it has stopped raining for about 3 hours in total since we have been here, its playing hell with my signage. One glimmer of sunshine during the day was that I finally caught up with Roger, when I had to drop off Brian's practice guitar at the band's hotel. I gave Taylor Snr and Jnr a chuckle with a wobbly, skidded entrance into the lobby; I do like to entertain when I can. We chatted about Chelsea's gritty win against Arsenal, but more importantly about West Ham' (my team) and their outstanding win away against Man City, their rise up the table and next season's move to the Olympic Stadium. No business talk, just a good footy gossip. Another night, another thunderstorm, it's quite the support act. Speaking of support acts there will be one tonight, maybe even two, this is currently being confirmed. Regional law here in Porto Alegre insists that any international acts who visit and play here must allow for a local act to support them - fair enough, it's quite a nice idea, I think - so prior to Queen and Adam hitting the stage, you will be entertained by a currently unnamed DJ. Party on people. Soundcheck is currently crashing around the empty arena, we've had Roger having a particular harsh run on the kit, a run through of 'Crazy Little Thing Called Love' and 'I Want It All' is currently being played with, Adam is focusing on his vocals unaccompanied between songs. I popped outside between showers and said 'Hello' to a couple of fans that I know and have made the trip over from the UK. They are here early to get to front of the general admission standing area or sponsored 'The Bud Zone' as it is officially called. Local hospitality is looking after them too, staff from the venue had come out and offered them chairs to sit on, knowing they had a long wait until showtime, how nice is that? It's the little things. Our last show in Brazil is now upon us, the band sound pretty tight out there at the moment and there has even been a little tinkering with the set list. Let's go out with a bang, huh Porto Alegre? Porto Alegre: Worst weather, best show. I make no apologies for that assessment Sao Paulo or Rio, it's just how I saw it. A leaner and meaner set was played at this show, with the removal of Save Me, '39, The Show Must Go On and Stone Cold Crazy and a little re-jigging of the set list - some will disagree, but less is more sometimes. Another thing, this was the best I have ever seen Adam perform, he was on it from the word go. The impression I got was he pushed back the 'peacocking' and just went for a high-energy performance, he really seemed focused. It's funny how some songs are received differently from gig to gig. The biggest roars of the night in Porto Alegre, to my ears, were 'Seven Seas Of Rhye' and 'Don't Stop Me Now', not the most obvious, but I like a little twist to things. My personal favourite part of the show was Adam's call and response after 'Tie Your Mother Down’, which segued into a cool little jam. I have new thing too. I like to give out set lists to people at the end of the shows if I can. I pick who I give them too, I just love seeing those faces light up. I think it's because I'm a dad. Thanks Brazil, it's been a blast, short but sweet and I will return. One cool little fact for you; my older sister lives in Brazil and she text me to say in the wake of Rock In Rio A Tarde FM Radio have not stopped playing 'Love Of My Life', she said it is on multiple times EVERYDAY. Well, let's remember what Brian said..."It's your song Brazil..."
1) We skipped our bags being scanned and checked at Argentinean customs because we were 'with Queen'. Not sure that was completely responsible behaviour by the staff, but we did appreciate it - nothing like a name drop though eh? 4) But the best was Pete Malandrone's boarding pass. It was printed as thus 'Peter Guitar Malandrone'. He is currently not answering to his first name, only 'Guitar'. All that and we had not even got out of the airport terminal. 'Queen Crew Mania' anyone? Two days off in Buenos Aires then. Some stay in their rooms and watch films, others venture and visit graveyards. Some prefer room service, others have lunch and whilst watching live Tango dancing. Some went out drinking and were not heard of for 24 hours, I went for a massage. Everyone is different in what they do, but rest was needed, as the schedule had been quite brutal, especially with the late stage times. I caught up with some work, checked in the Queen Productions London and spoke to home. For one of my days off I was lucky to have a guide and managed to see a bit of the city. I have known Wilki (or Pablo as I found out) several years now, he translates all the news and copy into Spanish for QueenOnline, as well as several other bits and pieces in the region. We meet up and he insisted on show me around and I am glad he did, I got a history lesson, a politics lecture and walking tour of Downtown. I summarised it as thus; the part of Buenos Aires I saw was like New York with a Barcelona attitude. Is Lenny Kravitz big here? I just seemed to hear his tunes everywhere I go here. It's not a bad thing, as long as you stick to his first four albums only. The crew party was last night - what goes on tour stays on tour and all that...! Not really. We went out to a really nice pizza restaurant, band and management included, and had jolly old time, super food, some amazing red wine and cocktails and a great laugh. Roger led the "Cheers!" and the downing of a shot of tequila and Brian's declared us as...(rude word coming up) "The best f*cking crew in the world!" - I'll take that, I have only ever been in one crew, so a 100% record for me! ...Today we have bright sunshine! Although still a bit windy, coats have been retired for now, the shades are on and 'Guitar' has just given us a short medley of AC/DC riffs as he tests out BM's Red Special. Soundcheck is imminent, in fact, I have just heard over the radio..."Are you ready for Rog to come and make some noise? Over." I have been told that not only does an Argentinean crowd sing every word, but it has been known that they sing Brian's solos! Bloody hell Adam; don't tip them over the edge. On go on then, I've never seen human combustion before. 'Physically passionate' is how I would sum up Buenos Aires. And then some. I had been warned and I had watched AC /DC’s ‘Live At The River Plate’ in preparation, but I thought it was just clever editing. Whenever the music stepped up in tempo. BOOM. The crowd would explode in unison. Now there are the obvious rockers that any crowd would respond too, 'Tie Your Mother Down', 'One Vision' or the bounce of 'Don't Stop Me Now' and 'that bit' in 'Bohemian Rhapsody’. However if there was any opportunity, in any song to start a 'mosh pit', (Yes, head banging!) this crowd took it – ‘Crazy Little Thing Called Love’? ‘Radio Ga Ga?’ This crowd smashed it. Apart from a flight delay, the most interesting event was a crew bonding session watching South Africa play Western Samoa in the Rugby World Cup at the airport - witnessing a full bloodied Welshman (Adam) trying to explain the rules of Rugby Union to an American (Security Dave) was quite amusing. We had a great load in too - how uneventful. Excellent for us, but for these notes, not too exciting I am afraid, and now here we are on show day at the Orfreo Superdome and again, things are going smoothly. Maybe the crew has hit a groove, just as the tour is concluding. Prior to soundcheck I caught up with Rufus on stage and discussed his imminent US and Australian tour plans with The Darkness and also, I quote, how "mental" the Buenos Aires crowd was. A little later, over in the Bass Department Neil, Chris (his tech), Adam (Carpenter) and I were discussed the merits or not of various Prog Rock bands, the conversation moved on to Thin Lizzy and I was chastised because I only "like a couple of tracks..." - I love these conversations. Soundcheck saw 'One Vision' blasted out quite impressively and some focus on 'Somebody to Love'. I have just popped around the dressing rooms to deliver tonight's set list; Brian was on his computer and looking forward to tonight’s lunar eclipse, Roger was reading and Adam was on his phone. Not so rock n' roll the second half of this entry was it? Come 9.30pm tonight, things will get a little louder, don't you worry. Update: Oh, it's got louder alright - I'm missing the show...adiós! So here we are, the last show of the 'Don't Stop Them Now' tour of South America, well, Brazil, Argentina and Chile anyway. I am sat backstage here in Santiago in our 'offices' that resemble the sort of white draped marquees that you get at weddings; it's certainly different. My soundtrack to me tapping away at the keyboard is Rhianna...not out of choice I must stress, she is 'playing' the venue next door. I can honestly say I have never listened to this much of her music EVER. This will be a unique one-off experience, I can confirm. Let's back track a little, we must not forget Cordoba, our previous show. I have to admit it was the one show that was quite a blur for me, not sure why, I think I was quite busy, bopping around backstage, but the stand out moments are very clear. The Cordoba crowd was the most tuneful audience I have heard on this trip, not the loudest or the most vocal, but the audience that hit the notes best, 'I Want To Break Free' was particularly good. 'Fat Bottomed Girls' is real favourite of mine and I enjoyed watching it from the video deck that was situated behind the stage and marshaled by Baby Jesus (aka Steve Price), watching what all the band AND the crowd are doing at the same time is really quite fun. 'Love Of My Life', as it has been at all the gigs, was the showstopper; Neil and myself exchanged a nod and a knowing glance as we stood at the back of the stage watching Brian, Freddie and the crowd raise the roof. I always make a point of going out into the crowd during every show, just to enjoyed it like a fan and my choice of song at the Orfeo Superdomo was ‘Tie Your Mother Down’, I then made my way to the sound desk and stood there with some of the crew for ‘Don’t Stop Me Now’, after I got told off by security for touching the barrier surrounding the team working the sound, much to their amusement. Back to Santiago and the Pista arena then, and the final gig. There is a nice relaxed feel today, the sun is shining, the catering is really great and suits our marital tented surroundings, there are birds singing inside the backstage area and some local venue dogs walking around looking for attention. The venue itself sits in the foot of The Andes, so the view is spectacular and we have just been told that there are free massages available for the rest of the day - all very pleasant, I must say. Santiago was a pleasant surprise to be honest, the most Western feeling city we have visited, all very modern and clean - it then dawned on me why everything looked so new; earthquakes. There was tremor about 3 weeks ago and was even an aftershock on the day we arrived, I just hope our there is no physically clash between the Classic Rock and the geographically kind tonight. People have been talking about home in the last couple of days, myself included; what they aim to do when they return and planning their next gigs, lots of mentions of family and kids - plenty of Facetime, Whatsapp-ing and Skype is always being had in between shifts. The band is due to sound check at 4pm and has just arrived. About an hour ago, and as per my request, Pete has finally played some Status Quo in his warm up of the Red Special. This all came up when we went out the other night and during taxi ride to a quite bizarre seafood restaurant (waiters dressed as sailors, walls dressed with Second World War helmets, mortar shells, sandbags and a camouflage table cloth) I, Pete and Will (Monitors) discussed our love of the Quo, ELO, the Bee Gees and Abba - I told him I was rather disappointed I have not heard him crank out some denim clad boogie. It's just great be surrounded by true music fans and geeks, Will also confessed to being a former member of the Queen Fan Club. Soundcheck: They played ‘Let Me Entertain You’ from Jazz instrumentally. Wow. What a treat. Neil was beside himself when we caught up later. The latest set lists were delivered and saw me enjoy a nice chat with Brian about his visit to the Paranal Observatory, and then discussing Bob Dylan with Rog and the forthcoming 'Bootleg Series' release that covers of Mr Zimmerman’s golden era between 1965/66. I was just about to post this up with an image of the stage in it's current state, but then Robin (Lighting) popped in with this shot of his view up in the Q or the 'Hamster Wheel' as its called by those who work closely with it - the sights you see on tour. And who would have thought I would find myself in Chile, underneath The Andes, in a white draped room, having a massage and being serenaded by Roger Taylor as he hammers the living hell out of his drum kit. It's A Hard Life, sometimes. Santiago, you are the encore tonight, send us all home with a good one. In (seismic) rock we trust. Sorry for the delay in this concluding part of these Tour Notes. I have had a visitor by the name of Jetlagus Maximus to entertain and he really has outstayed his welcome I must say. It also feels a bit odd tapping this out in the comfort of my own home. We better dive straight in, as the memories are still fresh, if you are still interested of course. The tour is over; we have quickly moved on here at Queen HQ, it never stop. It's all about the forthcoming 'A Night At The Odeon' release now. "Are you sure you have time Nick? You are not too busy having massage are you?" - Jim Beach joked. I think. Apart from that, it was business as usual for me pre-show (set lists, water and towels to the backline guys and set up the Queen quick change tent behind the stage), but I did make a point of clearing up any other chores, so I could enjoy more of the show for myself, it was the last one after all - for now, anyway. The fine and bright day had now disappeared and the evening had quite a chill to it, but the vibe was very warm indeed. The final show was another corker. As mentioned previously there was a very laid back feel to the day and this rolled over into the show from what I could see. Santiago, you seemed like a very happy crowd, very smiley and fun, from the faces I saw. I know, I have now said something nice about every crowd we came across, but that's the truth - the following here in South America really does have the most unique passion and lust for these songs and the band. I salute you. I had a really good spot on stage for this show; owing to the tight layout on the side of the stage on this particular night, I was very close to the action and had a great view in seeing at how good Rufus and Neil really are. Knowing the ebb and flow of Brian's guitar solo, I knew when to get in position for 'Tie Your Mother Down', I knelt just in front of the thrust then leads to the B-stage and I am so glad I did. The version of this song was hands down the best I have ever heard of this line up deliver - everyone was on fire, especially Rufus and Brian. I am no musician, but I can recognise 'good'. Rufus was just devastating - driving the song on and on, harder and harder and Brian was just out there on the edge, jamming away, taking it higher and higher, you could see the thrill on Neil's face as he was looking to see where the Doc was going to take them. I was actually laughing in awe, if you can do such a thing. I was kind of spent after witnessing that and walked out to the sound desk for a breather and watched the communion of 'Radio Ga Ga' unfold with quite the satisfied smile on my face. What an adventure this had been. AGAIN. After the show the band hung around for a lot longer that normal, the guest list had been quite large and there were a few friends to see. This also meant that the band could speak to the crew and thank many of us personally for the last 3 weeks or so. I again spoke to Brian and asked him if he had enjoyed himself; "Yeah, it still doesn't not get much better than that, it's been great, Nick." I wished him well and promised I would come down and see him in his studio soon. It turned out that the band actually semi-gate crashed an unofficial fan after show party at a hotel later that night; I hope they had the right passes. There was less of a rush to break things down seeing as this was the final show, so beers were cracked open earlier, sushi and pizza were enjoyed, rather than consumed as fuel, and most if the crew refrained from rushing off back to the hotel. Lots of hugging, handshakes and variations of "Stay in touch", "Facebook me" and "See you on the next one!" were exchanged. Not only is this crew amazing to work with, but such a nice bunch too, I have made some new and true friends on this tour. Oh, oh and talking of the crew, that reminds me! One of our translators in Brazil was quoted in saying that she thought we were "the best looking crew I have ever seen...” I'm adding that to the CV. I am trying to end this with a bang or some deep sentimental tone, but failing really. The last of us got back to the hotel at 4am in the morning, more hugs for those we missed earlier and we slowly made our way home in waves and at different times the next day or that morning should I say. I traveled back with Nev, Steve and Ross, the same guys I set off with three weeks earlier; no lost luggage incidents, a great milkshake at the airport, a mild panic for a temporarily lost mobile phone and several chuckles between us whilst waiting in Paris for our connecting flight and that was it. I watched 'Amy' on the plane, the Winehouse documentary - that was depressing and then Jurassic World, and that was just rubbish. Home. Wife and daughters. The biggest and best hugs of them all. They are my favourite audience. Five days later and I have only really started to unpack properly. My AAA laminates, set lists, hotel receipts, luggage labels and various currencies are littering the back bedroom and I can see my miniscule contribution to the Queen story right there, but it'll do me just fine, I will be living off it in the pub for years to come.